He was one of the painters of the Barbizon school, and is considered an important precursor of Impressionism. Daubigny was born in Paris, into a family of painters and was taught the art by his father Edmond François Daubigny and his uncle, miniaturist Pierre Daubigny. Soon after he was apprenticed to an engraver, and he was later to publish two albums of etchings in 1850 and 1851. Initially Daubigny painted in a traditional style, but this changed after 1843 when he settled in Barbizon to work outside in nature. During this period he sketched in the environs of Paris and the Forest of Fontainebleau. Even more important was his meeting with Camille Corot in 1852 in Optevoz (Isère). On his famous boat Botin, which he had turned into a studio, he painted along the Seine and Oise, often in the region around Auvers. From 1852 onward he came under the influence of Gustave Courbet. In 1866 Daubigny visited England,In London he met Claude Monet, and together they left for the Netherlands. Back in Auvers, he met Paul Cézanne, another important Impressionist. It is assumed that these younger painters were influenced by Daubigny. Daubigny's finest pictures were painted between 1864 and 1874, and these for the most part consist of carefully completed landscapes with trees, river and a few ducks. It has been said that when Daubigny liked his pictures he added another duck or two, so that the number of ducks often indicates greater or less artistic quality in his pictures. Daubigny is chiefly preferred for his riverside pictures, of which he painted a great number, but although there are two large landscapes by Daubigny in the Louvre, neither is a river view. They are for that reason not so typical as many of his smaller Oise and Seine pictures. aubigny died in Paris. 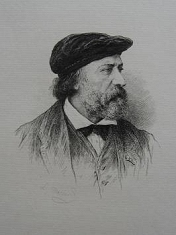 His followers and pupils included his son Karl (who sometimes painted so well that his works are occasionally mistaken for those of his father), Oudinot, Delpy, Albert Charpin and Pierre Emmanuel Damoye.